Thanks again so so much to you, Arnold, Ritchie, Derek, Dave and everyone else at Palmerstown House. As I said to you we had an amazing day, thoroughly enjoyed by everyone, especially us. I’ll be sure to send you on some photos and also to pop a review on your Facebook page. 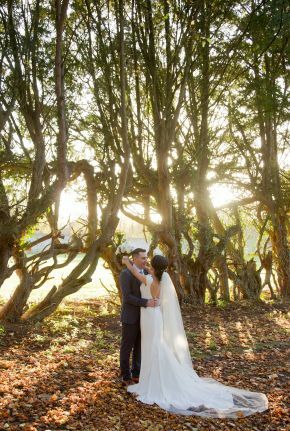 We knew from the moment we arrived that Palmerstown House Estate was the venue for our wedding day. You could sense there was something special about the house. Chelsea made the whole process very easy with her professional yet friendly approach. We felt no query was too small. Our guests were raving about the day and enjoyed every minute of it. Once again we can't thank you enough and be would definitely be recommending Palmerstown House Estate as the best wedding venue! Big thank you to you, Arnold, Gosia, Dave and Derek and all the staff of Palmerstown House Estate for making our day so special. Ourselves and our guests had an amazing experience and that is large part down to you all. We had the most magical of days that we will cherish forever. The whole planning of the wedding was stress free and it is thanks to you Chelsea. Even last minute requests were catered for. Palmerstown House Estate is a special place and you are a great team. 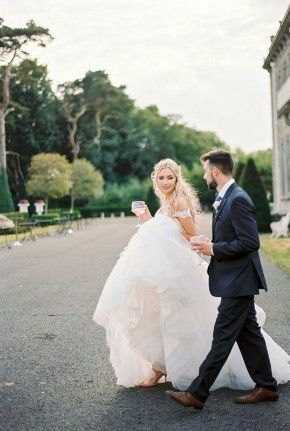 Planning our wedding and the day itself in Palmerstown House Estate were beyond our expectations. The homeliness and personal connection that you could feel in this grand beautiful big house was what made it the perfect venue for us. While planning Chelsea answered all my questions ,big or small,quickly and always friendly. On the day we all felt we had stepped into our own house for the day, being met at the door by our new friends Chelsea, Arnold and all the staff. Really ,it’s hard to describe but I know it’s something we wouldn’t have felt in a more conventional hotel venue. The staff, the food and the house itself are a very special combination. Every guest from the oldest to the youngest had a wonderful day. We can’t thank everyone in Palmerstown House Estate enough. From the moment we attended the open day to view Palmerstown Estate we were blown away. Everything about the venue appealed to us. From our first appointment with Chelsea to walking out the door the day after our wedding everything was handled perfectly. Every query before the big day was answered promptly. The day itself ran perfectly. From sandwiches in our room on arrival to the bar staying open to serve our guests late into the night. Chelsea, Arnold and the team were fantastic. 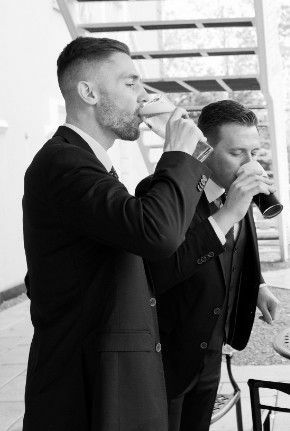 Chelsea handled everything so efficiently and without a fuss, including getting Jim a stiff drink just before the ceremony. Our guests all commented on the day how beautiful the venue is, how much food there was and how well it was presented and tasted and how helpful the team were. The day was handled so professionally, we would not have changed one thing about the day. We would like to say a huge thank you to everyone for making our day so special. With special thanks to Chelsea and Arnold and his team. We just want to say a massive thank you for our amazing wedding day!! It was perfect! 💖 Extra special thanks to you, Arnold, Derek, Dave and Gosia, you were all unbelievable and it really made the day extra special!! Everyone was raving about the whole house and the food!! Ive a few pictures we've managed to get a hold of so far,feel free to use them on your Insta etc 👰🤵 ill whatsapp them to you...I think they're too big for the email! Thank you so so much again!! We definitely had the best day of our lives!!! We would like to send our sincere thanks to you for organizing the most perfect day of our lives. Everything ran smoothly over the past few months and the yesterday was spectacular. The staff in the Manor were so courteous and helpful to us and all our guests. A special thanks to Arnold for his professionalism and kindness. Finally the band 52nd Street were fabulous and had the floor full all night. Again our sincere thanks, Conor & Brenda. What can we say! Words can't describe how amazing our wedding day was at Palmerstown. Our guests came in from Canada and all over Ireland for the day and they are still talking about how fabulous the venue, food and service was. Myself and my husband Dave couldn't speak highly enough about Chelsea, Arnold and Derek, the service we received was 5* plus! We planned the wedding from Canada and Chelsea was responsive to our incessant text messages. Best day ever Thank you Palmerstown Couldn't recommend them highly enough. We got married at the end of October and I have to say Chelsea, Arnold and the entire team did an amazing job. No detail was too much and they couldn't have been more accommodating. They honestly made it the best day of our lives and I couldn't be more thankful. Thanks guys, you're really doing an amazing job and I hope many more couples have the fairy-tale day we had with you. You guys rock!! Myself and Barry would like to sincerely thank Russell, Arnold, Derek and all of the lovely staff at Palmerstown on Saturday and ESPECIALLY you. Everything was just beyond perfect from start to finish! We had such an amazing day and everything was taken care of for us. I will watsapp you a few photos that my friend wayne took. Can’t wait to see ruths photos! Thank you so much for everything Chelsea, you are really fab at what you do. Thank you so much for all the hard work you and the whole team put into making our day as amazing as it was. Arnold was the best throughout the whole day. Please tell him again for us, he is so very good at his job. I will get some good photos over to you when we have them. Our Wedding at Palmerstown House Estate on the 15th Sept 2018 was the best day ever, it was the day how we wanted it. The staff are amazing especially Sinead, everything was easy & fun from start to finish. The food was fantastic. We really cant thank you all enough. 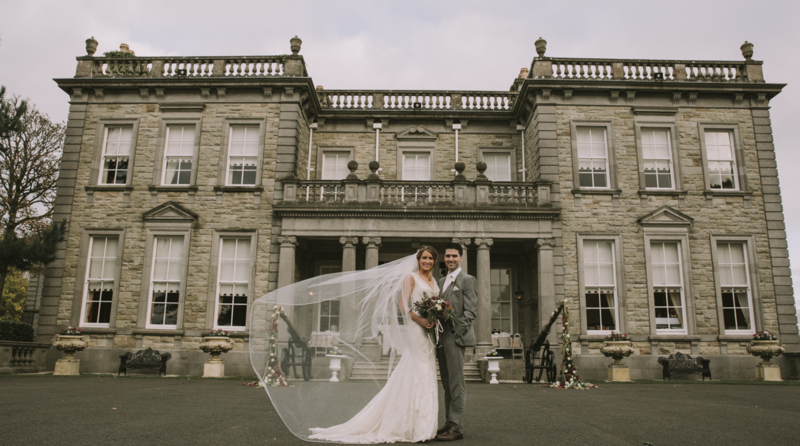 Palmerstown House Estate was just the ideal wedding venue. Having all our guests together in a private house meant everyone could really relax and be themselves, all our guests commented on just how lovely and intimate it felt. A massive thank you to all the staff at Palmerstown who are just excellent from start to finish! The smooth running on the day was thanks to all the advice and help given by Sinead, Arnold's easy manner and intuitive responses and Dave's fun and relaxed personality. We were delighted, of course, by the grounds, house and food also.A special thank you to Arnold and Dave who were just so professional, friendly and helpful on the day and were really a pleasure to deal with. The first time we visited Palmerstown House we were blown away by it. The manor house is rich in old time charm and beauty making it a truly romantic place to get married in. The grounds are beautiful and offer both formal gardens and wild meadows for photo and video shoot. Our wedding coordinators Chelsea and Arnold were a pleasure to deal with from start to finish. They made themselves available to us in the run up to the day and were extremely competent, leaving us with nothing to worry about. On the day, there was no shortage of food and drink. Many guests commented on how much alcohol there was at the drinks reception which is exactly what you want to hear! The food was excellent! We had fillet steak for main course and they were cooked perfectly to preference. We had our dinner and dancing at the Golf Club house and then returned to the Manor for late bar and sing song. All in all we could not fault Palmerstown, it was a wonderful experience and we would do it all again if given the chance! Chelsea! I am so sorry we are only getting back to you now, we have been straight back to work since we got back. Where do we start Chelsea? We could not have had a more magical or beautiful day. Every little detail was accounted for from Arnold at our side for anything we needed, to the breakfast in bed to the hilarious bar manager Dave behind the bar entertaining the yanks. Your organization and calm composure was most definitely appreciated on the day (and before that). Every single staff member was a delight to be around and our guests have not stopped raving about the reception. We can not thank you enough for your input and your hard work -it did not go unnoticed. Chelsea was absolutely wonderful from day one and nothing was ever any hassle. Also, on the day Dave was brilliant with timings and keeping everything on track. Chelsea and the whole team at Palmerstown exceeded our high expectations beyond words. They kept everything on time and the day was perfect from start to finish. The food was amazing and everyone was so impressed by the grounds and the whole atmosphere of Palmerstown. We couldn't recommend you highly enough, so great to deal with from day one. Thank you so much for everything. We got Married in Palmertsown House estate in May 2018. We fell in love with the venue as soon as we saw it during an open evening, and had it booked within 2 weeks!! We had the wedding in the Manor house, and it was stunning. The Staff are amazing, and made the preparation, leading up to and the actual day of the wedding so easy for us, we couldn’t have asked for more. Everyone was so pleasant, friendly and professional. The food was amazing, the venue looked fantastic, we have received fantastic feedback from all our guests about the food, the venue, the staff… and will definitely recommend Palmerstown House for your special day!! A special thank you note to Sinead, for all you have done for us, you made our special day magical and we will never forget the amazing job you’ve done for us!! We had an absolutely brilliant day celebrating our wedding at Palmerstown House. Sinead was excellent from day 1, and made the planning process went like a dream - there was definitely no wedding stress! The venue was absolutely beautiful and the bedrooms are stunning. It was great that having the whole place to ourselves and the venue staff were fantastic. Everyone was so friendly and professional and Arnold and the team made the day run like clockwork. The food at dinner was fantastic, several guests have been in touch to say it's the best food they've ever had at a wedding. The midnight snacks and breakfast the next day was also 5 stars. We went wanting for nothing on the day, and if we were to do it all again there is nothing we'd change! Everyone had a ball, ourselves included and we want to say a big thanks to all the staff on the day, and those behind the scenes and involved in the organisation who pulled off such a fantastic event. Thanks again! Our day was amazing from the moment we arrived the staff were so friendly and made sure we didn't have to worry about anything ...it was just a shame our day went so fast. Dealing with the girls through the whole experience was brilliant. Chelsea was amazing and we couldn't thank her enough. Hi Chelsea, Sinead along with Dave, Gerry and all the team at Palmerstown…. It’s said a few pictures paint a thousand words so attached is a few pictures of our day at your house from which you can see a great day was enjoyed. Thank you so much to all the staff at Palmerstown House Estate. We had such an amazing day from start to finish! Magical venue and incredible food - you couldn't get better! Fabulous day, perfect setting, cannot fault the staff, can we do it all over again please??! We had an incredible day at Palmerstown, with many of our guests calling it the best wedding ever. Many thanks to the fantastic staff. Our experience with Palmerstown House was first class!! We really wanted our guests to feel care for and we could not have asked for more from the staff and Palmerstown. Sinead McGoldrick is a first rate wedding coordinator, she knows this business so well and under her guidance you feel in very safe hands. The rooms in the manor house are unbelievable and everyone commented afterwards about the special feeling they had. 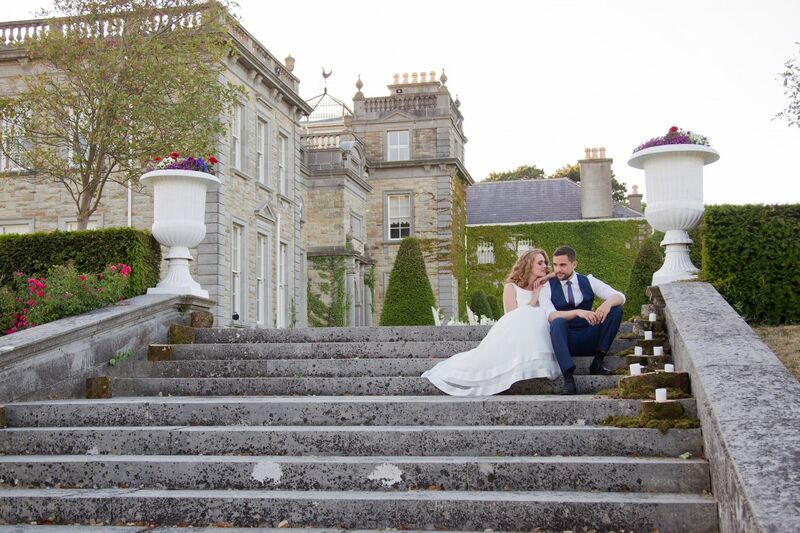 Overall we were so happy with our experience and would recommend Palmerstown House to any future couples in a heartbeat! Amazing venue and staff. 5 stars from start to finish! Chelsea, Sinead and the other staff at Palmerstown House Estate were so helpful and lovely. The facilities were beautiful and my guests are still talking about it. I couldn't have chosen a more perfect venue. The entire house and grounds were exclusive to me and my guests. We chose the all-inclusive package and the girls there organised the cake supplier, one of our bands and the photographer all of which were very professional and so talented. They went out of their way to supply hot chocolate as well as tea and coffee as not many of our guests drink tea or coffee and they had lots of shloer because very few of our guests drink. Our glasses were never empty! But most of all, they were so good at keeping me calm throughout the day and kept everything running smoothly. I can't thank the staff enough for making our day so special. We were lucky enough to celebrate our wedding in the manor house at Palmerstown House Estate on August 12th 2017. From our first viewing of the previous September we fell in love the the venue, it truly is a must see. On our first visit we just happened to meet Dave in the golf club and he couldn’t do enough to for us, including a private tour of the house. We were sold there and then. Over the next 11 months it was a pleasure getting to know the staff and no matter what we requested there was never any issues. They truly couldn’t do enough to help. The day itself was everything we had hoped and dreamed off. I can’t recommend Palmerstown House or its staff highly enough. Excellent venue and service!!!!! We got married at this stunning location in July 2017 and we cannot recommend the team or venue highly enough. From the minute we met Sinead and stepped into the house we knew this was the place for us. Planning the wedding from abroad could have been difficult but Sinead and the team were there for us every step of the way. 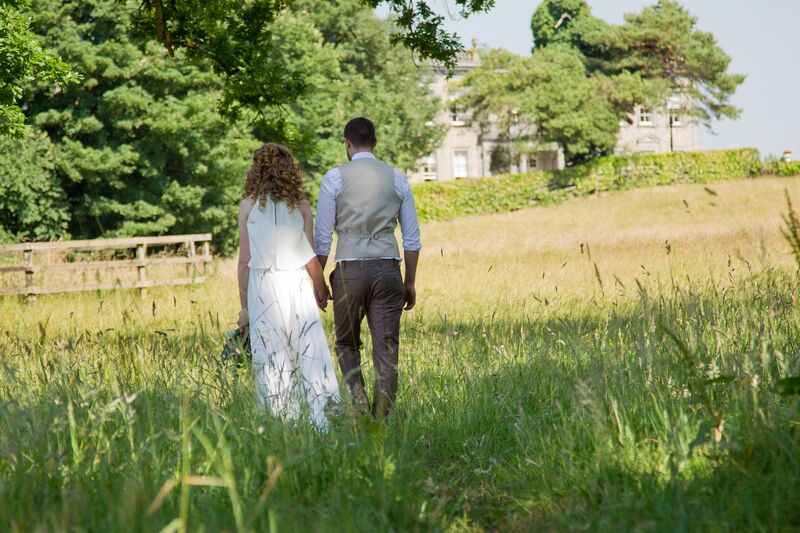 For us the day was about being relaxed and enjoying the moment with our close friends and family – PHE was the perfect setting and the Manor House felt like home. From the moment we arrived at the venue we felt that we could enjoy the day as Sinead and the team had everything under control. We had our ceremony and reception in the house and every detail was taken care of thanks to Sinead, Dave and Dave Kelly – it really felt they put as much effort into our day as if it was their own. Also the food was exceptional with most of our guests sharing compliments on this for weeks after. At Palmerstown House we didn’t need to have any compromises and it gave more than we expected. This is a true gem of a location and will always have a special place in our hearts. We cannot thank this wonderful team enough and we wish you so much success in the future. We got married in Palmerstown House Estate in July 2017. It is a beautifully understated exclusive wedding venue. Our wedding co-ordinator, Sinead, along with all the staff were so friendly, welcoming and professional in everything they did. We had a beautiful day that we will remember for the rest of our lives. We had our drinks reception and meal in the golf club and the afters in the Manor House. Everything went off seamlessly and our guests really enjoyed the experience. Thanks to everyone involved in Palmerstown House Estate. We had our wedding here on the 5th July 2017. We cannot thank all of the staff enough for their kindness and for looking after us and all the guests so well. We had an amazing time and all of our guests raved about the venue. They especially loved the food. We had a barbeque the day after the wedding which was so chilled and relaxed. The food on the second day was lovely too and there was so much of it. The grounds of the venue are gorgeous. All of our guests enjoyed walking around, seeing the animals (deer, horses, rabbits, pheasants) and playing golf too. A special thank you must go to Sinéad, the wedding co-ordinator who is incredible at her job. Her attention to detail is second to none and her love of her job is evident for all to see. I would not hesitate in the slightest in recommending Palmerstown House Estate to anyone. 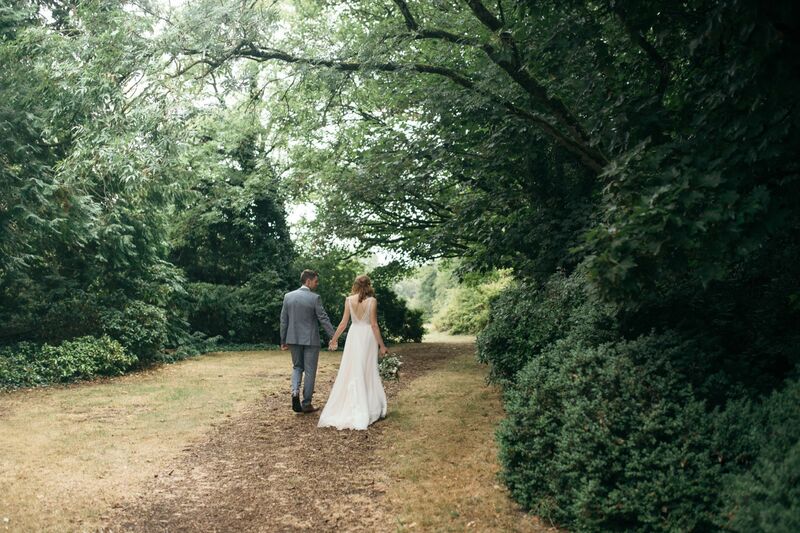 We got married on the June Bank Holiday weekend and stayed two nights in the Manor House. We could not be happier with our choice of wedding venue! Since we first stepped foot in Palmerstown House Estate, we have been overwhelmed by its elegance, style and beauty. The décor of the Manor is sublime and all modern finishings and renovations are sympathetic to the Victorian house. Our guests were stunned when they saw the main hall and staircase. It was the best location for everyone to dance and sing the night away! The grounds are fab with great choice for wedding photographs. Our guests are still raving about our beautiful meal and several have remarked on the exceptional quality of food and that it was the best meal they had had at a wedding -ever! Every course was absolutely delicious and Chef Russell truly delivered on the day. The Confit of Duck and Rack of Lamb in particular were unreal. Our barbecue the next day and was equally fabulous. Last but not least, what makes this an outstanding wedding venue? The staff. We have been overwhelmed with the level of professionalism, kindness and care and attention we were given while planning our wedding and on the day itself. Sinéad McGoldrick, Dave Rafferty, Linda Blanchfield and Dave Kelly helped make our wedding the special day we had hoped it would always be. Sinéad in particular was amazing to deal with and kept in regular contact to make sure we were on track. Any requests we made were granted with ease and nothing was a problem to organise -especially in the week before our wedding when things got a little crazy! Everyone was so lovely to us on the day and enabled everything to flow effortlessly. We have been amazed by the lovely, genuine people we have met along the way and how we were made to feel like Lord and Lady of the Manor, if only for a weekend! Thank you to everyone who made it possible. We just wanted to send you an email to thank-you so much for the amazing weekend you gave us for our wedding on the 29th April. We cannot express enough just what a fantastic two days it was and how attentive, efficient and professional each and every member of the staff were.It has taken us this week to really take in all of the events of the day but from talking to guests they have really emphasised what an amazing venue Palmerstown is. The quality of the food was second to none and guests could not believe how much of it there was available, so thank you to the chefs and all those in the kitchen and wait staff looking after us on the day.We had a great night in the house and could not believe the atmosphere. The buses from golf club to house were so efficient and all guests were transported up in a surprisingly short amount of time. We were a little worried about this so we really have to commend you all on your organisation! Can you please thank Dave the night manager for allowing us to feel like we were in our own home. He spent time and effort talking with us and our families and was always on hand through the (late!) night to make sure we were ok! Thank-you to Declan who didn't seem to sleep as we know he was there late into the night and again when we went for breakfast the next morning! He also patiently waited for us to reluctantly leave on Sunday and never made us feel rushed so we really appreciate that. Thank-you to Chelsea for all her work behind the scenes running the show both Saturday and Sunday and for everything she did for us as well. Sinéad, thank-you so much for looking after every detail of the wedding. I want to especially thank-you for the tea you provided for the older members of our family upon their arrival to the house from the golf club. It meant a lot that they were looked after like that. Our day could not have been more perfect and we will have nothing but fond memories to look back on. We are so sad that it is over but so grateful to everyone at Palmerstown for giving us and our families a day to remember for the rest of our lives and for that we cannot thank-you enough. Fabulous venue, amazing food together with kind,professional staff who went above and beyond for us. It is all too easy to become stressed by the endless to-do list encountered by anyone planning a wedding. We immediately felt confident that the team at Palmerstown House had each aspect under control and we felt very comfortable placing our trust in them. They did not let us down and surpassed our expectations on the day. Our main aim was to provide our guests with a fabulous venue and an equally fabulous meal. Our guests were blown away by the house and gardens; it was difficult to get them to leave the following day! People are still talking about the quality of the meal! From the reception all the way into the night, there was no shortage of food and drink. A hidden gem, right on our doorstep. We owe a depth of gratitude to Chelsea and the team for making our day so enjoyable. I would like to thank all the staff for making our wedding day so wonderful. We loved the venue, we loved the preparation with Sinead and Russell before the wedding and Declan did an outstanding job on the day. The food- fillet steak did not disappoint and the day was magical. All our family and friends had a great day and continue to compliment us on a great wedding and this is thanks to all the staff in Palmerstown House Estate and Manor. Five Stars! I fell in love with Palmerstown House Estate when I first set eyes on it. I wanted a location close to home that was not a hotel, and this was perfect, it’s a hidden gem just outside Dublin. The manor house is breathtaking, the scenery is beautiful and the Christmas decorations were up with no fairy backdrops in sight… only candles and fires. All the staff, especially Sinead and Declan, were so accommodating, nothing was too much trouble. They made the day so amazing for us and our guests, the food was outstanding. People still talk about it, they were in awe on the day in the manor house and couldn’t believe that it’s your venue for the day. Palmerstown house Estate were extremely accommodating and were very helpful whenever we had any questions. The staff were very professional and friendly, this is something that was noted by many of our guests. The food was delicious and we were thrilled to hear our guests raving about the entire meal. Our wedding day in Palmerstown house estate was amazing and I would love to relive it. We had an autumnal themed wedding at the end of October. The staff went above and beyond to help us with planning our day. We had regular meetings with our wedding planner at the estate. Everything that we wanted for our big day was made possible by the endless effort of the staff. To top things off we had an amazing fire work show which would not have been possible if it wasn’t for the cooperation and help from the staff. 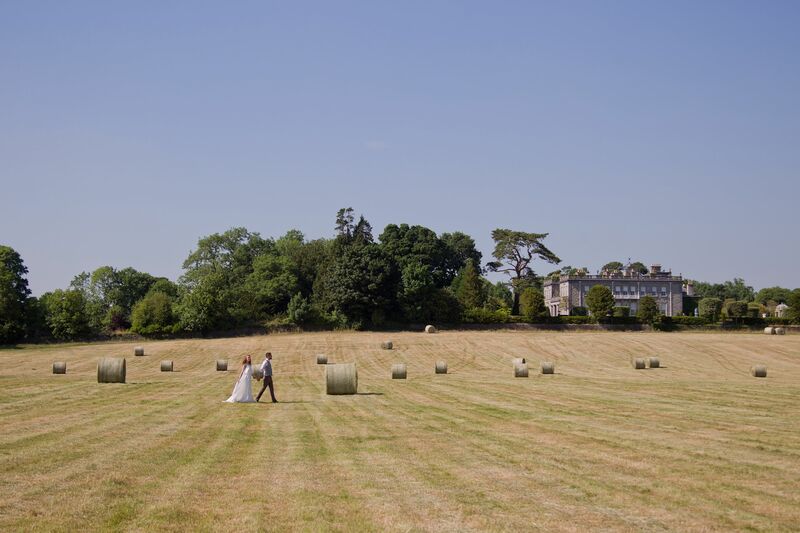 Palmerstown house estate is the most amazing venue for a wedding and we couldn't recommend it highly enough! Thank you so much for your help and efforts in making our wedding day so special. It was more than we could ever dreamed of, we would also like to compliment your staff whose exceptional service, professionalism and friendliness will be long remembered. In particular, we would like to thank Linda Blanchfield, Chelsea Crowe, Sinead McGoldrick and the General Manager, Jerry Power. 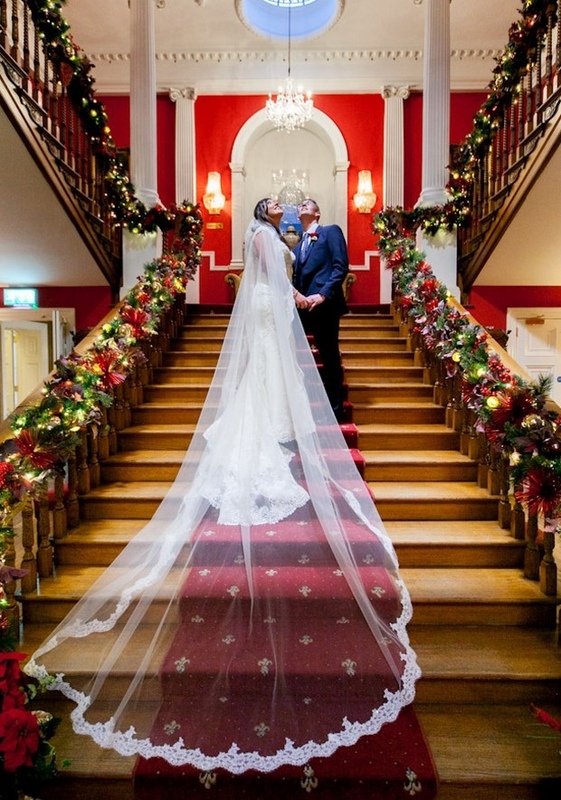 Everyone really enjoyed the festivities which were spread over two days and nights and since the wedding we have heard nothing but praise from our guests for Palmerstown House Estate as a whole. Thanks again for a truly spectacular day. From the very first contact to the last glass of champagne it's been a lovely experience! Our guests are still talking about the amazing food, the intimate venue and the genuine friendleness and welcoming staff. We wouldn't hesitate to recommend Palmerstown to our friends & in fact would love to attend a Wedding there ourselves but as guests this time! We celebrated our wedding with 110 guests in August, in the Manor House. From our very first meeting with our wedding planner we knew this was where we wanted to have our wedding . We opted for a civil ceremony in the Main Hall (within the Manor House). 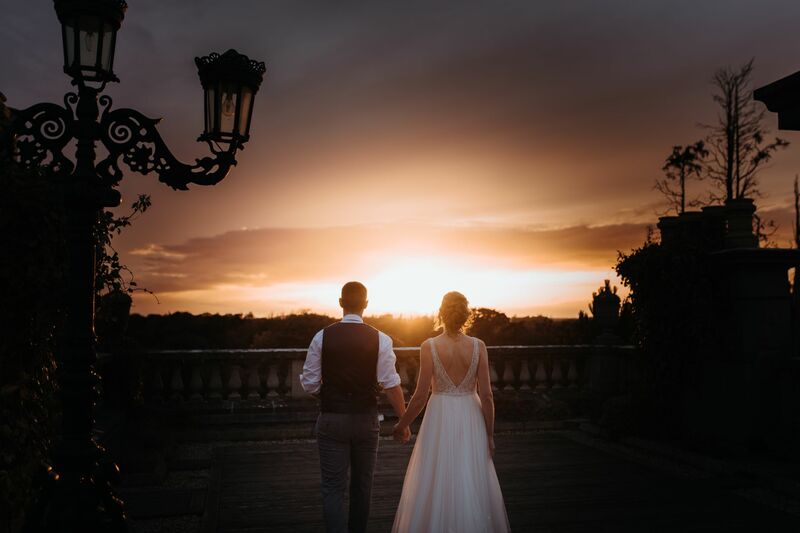 The day and night were perfect in every way and even now weeks later our guests are still commenting on how fantastic the venue and especially the staff were. They truly deserve the highest praise and I would recommend any couple too consider this as your wedding venue. The setting, hall and rooms are amazing. We fell in love with what can only be described as a magical venue while we visited Santa's House Express. Love it love it love it and can wait to go back again this Christmas! A magical, memorable welcome was shown to us and each of our guests at Palmerstown House for our special day. As the first gay wedding in the House, we enjoyed a positive, affirming and special service from all the friendly staff who made our celebration a most joyous occasion for all our guests, who cannot stop talking about the venue! We are indebted to Chelsea and all the friendly and exuberant staff who worked so hard to make our day special. 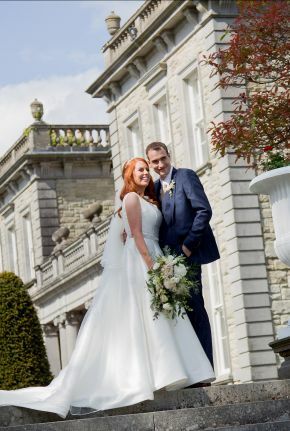 We really loved having Palmerstown House Estate as our wedding venue, we were very lucky to be able to have the whole house for Friday, Saturday and Sunday of our wedding weekend. The staff and service was excellent throughout and they made us feel at ease and well looked after for the whole weekend. We planned our wedding from overseas so to be able to have good faith in our hosts was important to us and they delivered. To all staff at palmerstown house. Thank you soo very much for being such a huge and fantastic part of our wedding day, we had the most amazing day. Everyone here really was so amazing to us and all of our guest, we were mesmerised and everyone has been talking about how incredible the day was. Quoting the best wedding they had ever been to. Thank you soo soo much for being part of such a special day for us and making its so truly special, giving us such wonderful Memories we will treasure forever. We can't thank you all enough every single one of you all the staff were just to great, so professional, so friendly, you couldn't do enough for us. The food was incredible, the service, just everything was so so perfect. And of course the venue speaks for its self it's it's the most stunning place. We live in the uk and we felt like everything was organised perfectly we felt assured the whole way throughout our planning, and our needs and wants were meet 100% and more. Any couple looking for their perfect wedding venue please please book here you will not get anything better i promise you. We had my sons wedding there last Saturday. An absolutely stunning fabulous place. Wonderful decor and art work and a huge big sweeping staircase as you enter the house. Food was superb from the h'or dourves to the hot food at the end. Staff very friendly and helpful. Bedrooms magnificent. All huge. Grounds are splendid. This place is a hidden gem. All in all a truly wonderful wedding day was had by all. Thank you to the staff at the Manor House. We had our wedding in this fabulous venue on 10th June. We had arrival drinks in the Manor House where we also had the pleasure of releasing doves followed by our reception in the Club House. The staff went above and beyond for us for the whole day. Thank you so much for making our day so special. 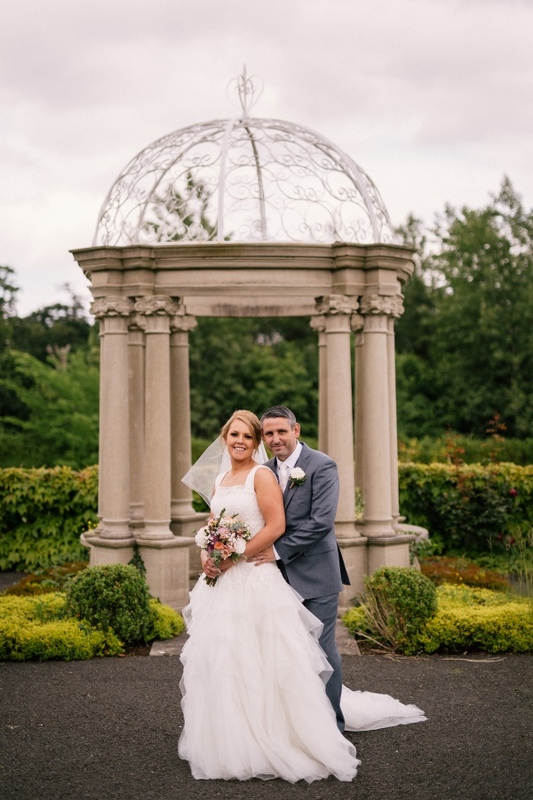 We recently got married in Palmerstown house and held our reception in the golf club. We were lucky enough to have such fantastic weather which showcased this beautiful venue in an amazing light! Chelsea, Laura, Stephen, Declan & Dave the night porter couldn't have been more friendly & accommodating along with the rest of the staff who ensured our day went seamlessly. Highly recommend this venue. As you know we had our wedding at Palmerstown House on 17th of July. We cannot thank you enough for all your hard work and amazing organisation for our big day. Everyone who attended the wedding are still talking about how good it was. We put that down squarely to yourself, Jerry, Declan & all the other staff who seemed to go out of their way to make everyone relaxed and want for nothing. It was a true 5 star experience for all concerned, what a beautiful venue to have a wedding and what service was provided to compliment this. The rooms for each guest where beautifully laid out, the food on the day/night was just out of this world. Please pass our thanks to Dave the chef and his staff. Thank you so much for everything and we truly mean it. Please pass our extended thanks to Declan and the waiting staff who tended to our every need. One final and huge thank you is to Dave the barman who couldn't do more for us, what a gentleman who really added to everyones night. I think people can be very quick to put to paper or send e-mail's to complain about the service they have received and would like to highlight the absolute profesionalism of you Laura and all other staff who helped make our wedding day that much more special.